In 1926, a Mr. Julius Freed opened an orange juice stand in Los Angeles, only to find that although his product was excellent, business was not. One of Freed’s associates, a chemist by trade, decided to experiment with juice augmentation formulas, and through said finagling formulated a concoction that is with us to this day. Pour 6 1/2 ounces of the orange juice into an ice-cube tray and freeze until solid, approximately 2 hours. Store the remaining 2 ounces juice and the zest in an airtight container in the refrigerator until ready to use. Combine the frozen juice cubes, reserved orange juice and zest, milk, confectioners' sugar, and vanilla in a blender and blend until smooth and slushy, 30 to 45 seconds. Serve immediately. ‘re: Alcohol… No Gran Marnier? I’ve made a very decent facsimile of THAT drink with OJ concentrate and avocado. I do seem to recall ordering Orange Julius in the early ’70’s with the option of malted milk powder added. I have always made it that way since. how much MM powder would you use for this recipe? Years ago we used the boxed cool whipped mix as the dairy component. It tasted very close to the real thing. Bob: re: Adding booze. This comes with a risk of curdling the dairy, causing an unpalatable mess. OJ and booze are both acidic. Too acidic curdles the dairy. May work with half&half or heavy cream. Preferably very fresh (less acidic on its own) and very cold, cold blender bowl, and add OJ/alcohol slowly while blending. I’ve just found this now and haven’t yet tried this fix, though I’ve curdled prior attempts at this recipe. Alcohol is basic. NOT acidic. Ethanol is slightly acidic – very close to neutral though. Alcohol’s (chemically speaking) all have protons that can easily be removed. Now, if you are saying that certain spirits/liquors, due to their non-water and non-ethanol components, tend towards being basic, it would be important to clarify which spirits/liquors you are talking about. I have been using non-dairy coffee creamer instead of milk. It has been part of our Christmas breakfast tradition for decades. Orange Julius was (and probably is still) made at their stands with orange juice, crushed ice, and mixture consisting of powdered sugar and powdered egg whites. The egg white gives it that creamy, frothiness. Was there some vanilla flavoring in that powder? Possibly. Growing up we used to make our own using a raw egg white (’cause we were ignorant /unafraid), but meringue powder would probably be the best option for those who don’t want to walk on the wild side. What are your thoughts on using a lower or no-fat milk? Great though! What about blending in the egg? Is there one person or a team of people who do the photography for your site? I am constantly impressed with the stunning images used and I love the very laid back style. Not just here for the photography…the food is pretty fantastic, too. Any recommendation on adding booze ? I would recommend it maybe a vanilla vodka? Or orange voldka? Godiva White chocolate liqueur. For a stronger drink, add vodka as well, triple sec is also good. But the white chocolate liqueur would be amazing and creamy in this. 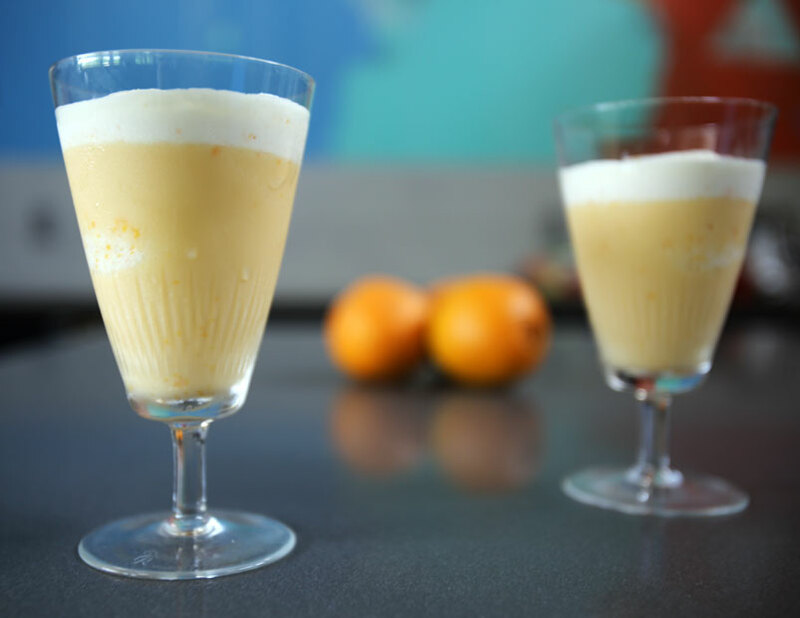 We would use orange juice and vanilla ice cream with the Godiva and vodka to make a “Creamsicle”. Using the frozen juice and the milk would make it much less rich in a good way! Makes me sorry I no longer drink alcohol because I want to try it LOL. If adding booze, you could use powdered (or fresh/raw) egg whites as was suggested elsewhere. I imagine it would be like a syllabub. Campari or aperol might be a nice addition. I make this all the time, it’s awesome. It’s even better than the original that it’s based on IMO. Maybe it’s just where I live, but last time I had an actual Orange Julius it was a bit bland, it didn’t pop the way these do. Maybe they don’t use fresh orange zest anymore or something.